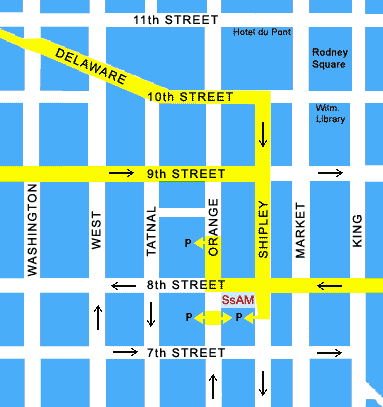 SsAM is located at 719 N. Shipley Street, at the corner of 8th and Shipley in downtown Wilmington, Delaware. We are located near Interstate 95 in downtown Wilmington, Delaware, at 8th and Shipley. This is one block north of Market Street, within walking distance of several restaurants, the Grand Opera House, Christina Cultural Arts Center, the Delaware School of Art & Design, several downtown college branches, corporate offices, and the Community Services Building. From the south, driving north on I-95: Take I-95 to the Delaware Avenue South exit No. 7 (toward Route 52/Delaware Avenue). Turn right onto W. 9th Street. Turn right onto N. Shipley Street and go one block. We are on the corner of 8th and Shipley. Parking is just beyond the church, on the right. From the north, driving south on I-95: Take Exit 7A towards Route 52/Delaware Ave. and stay straight on W 11th Street. Bear right onto Delaware Ave and onto W. 10th Street. Turn right onto North Shipley Street. We are on the corner of 8th and Shipley. Parking is just beyond the church, on the right. Click here to see a Google Map of our location in downtown Wilmington. Free parking is available on evenings and weekends at three parking lots and on the street. 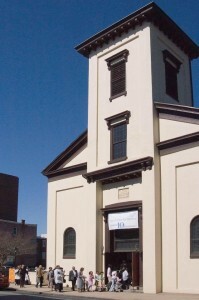 One parking lot is adjacent to the church. It has an entrance off of Shipley, just beyond the church, on the right. It also has an entrance off of Orange, after 7th street. Another parking lot is across Orange Street from the parking lot described above. A large parking lot run by the City of Wilmington is at the corner of 8th & Orange. During business hours, metered parking on the street is usually available, or you can park in either of the above lots for a nominal fee. The spaces on the right hand side of Shipley Street (in front of the church) become a tow-away zone between 4:00 and 6:00 p.m. on weekdays, so please exercise caution if using these spaces during or close to these times. Click here to visit the Delaware Rapid Transit website. As of March, 2013, Route 32 (The Wilmington Trolley) comes closest but doesn’t run on Sunday. Routes that run every day of the week are 8 (running on 8th and 9th streets), 423 (on Orange and King), and 1, 3, and 9 on King.